Orlando, FL — All American Portable Air today announced it has increased its inventory of dehumidifiers and air scrubbers to meet the demand for dehumidification and humidity stabilization in construction, remodeling projects and disaster drying. 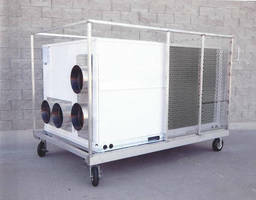 The portable equipment speeds up the drying time and stabilizes the humidity levels during the construction process. For emergency climate control rentals, the company has increased the number of portable dryers, portable air conditioners, and propane, electric and natural gas heaters. All American Portable Air has also added new equipment to its inventory that includes three sizes of dehumidifiers and three sizes of HEPA air scrubbers. “With over 15 years of experience in the business of rental climate control equipment, we understand the benefits of using climate control in construction projects,” said Roscoe Nesmith, president of All American Portable Air. With offices in Nashville and Orlando, All American Portable Air is available to supply rental products to companies throughout the United States. Nesmith and his Tennessee manager, Trey Adkisson, are Leed IAQ Solution Providers and EQ3 Leed Construction Management Consultants. They are available for both site inspections and telephone consultations to work with customers on their air quality and climate control needs.